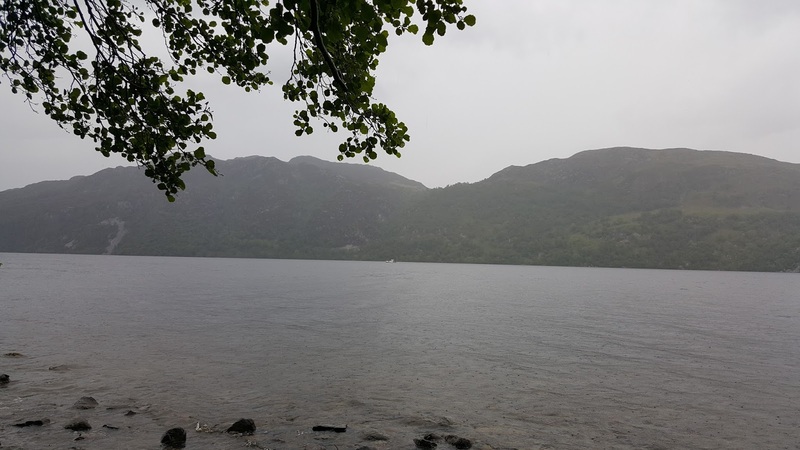 Once again, it was off to the shores of Loch Ness as another drive up the A9 road was undertaken a couple of weeks ago. But even miles from the loch on the A9, passing the Slochd summit and looking aside to the location of General Wade's military road, one was reminded of the old tales of the Loch Ness Kelpie which used to tarry by the wayside of the Pass waiting for its tired victims to chance upon its inviting saddle, only to be plunged to their deaths in Loch Ness with supernatural speed. Such a fate is hardly expected these days as we finally drew up at the campsite near Foyers, though those mini-monsters known as "midges" were certainly out in force to take a piece out of you if you were to unwarily walk into a cloud of them. Nevertheless, the view from the tent more than made up for that. Having had to deal with various situations prior to leaving, there had not been as much time to prepare as normal, but everything seemed to come together as I undertook my usual night ride at 3am along "Monster Alley" between Foyers and Dores. When I do this in August/September, it is usually quite dark, but with only a few weeks to the Summer Solstice, it never seems to get totally dark this far north. So, with the dashcam attached, recording conditions were better for anything that may loom out of the twilight into the view of the camera. As stated before, this stretch of Loch Ness road has the highest historical incidence of land reports of the monster. However, the odds are still great against seeing any such thing, so I also do the run to record anything else of interest that aids further study. That includes sightings of deer which some claim are land sighting misidentifications. I now have enough data to challenge that in a future article. As it happened, I did not bump into any cryptids, but I did collide with an unfortunate deer. I didn't actually see it as it came out from the lochside (to the left) only about two feet in front of the moving car. The result was predictable as I felt a thud but, perhaps fortunately for the deer, I didn't go over it with my wheels. I think the car, which was doing about 20-25mph, hit it almost side on and bounced it back into the loch. Going back to the area revealed no dead/injured deer on the road or anything to the side, so I suspect it may have tumbled to the shore or eventually staggered off. An examination of the dashcam recordings revealed it was indeed a deer that collided, but I won't put it up here in deference to more sensitive readers. 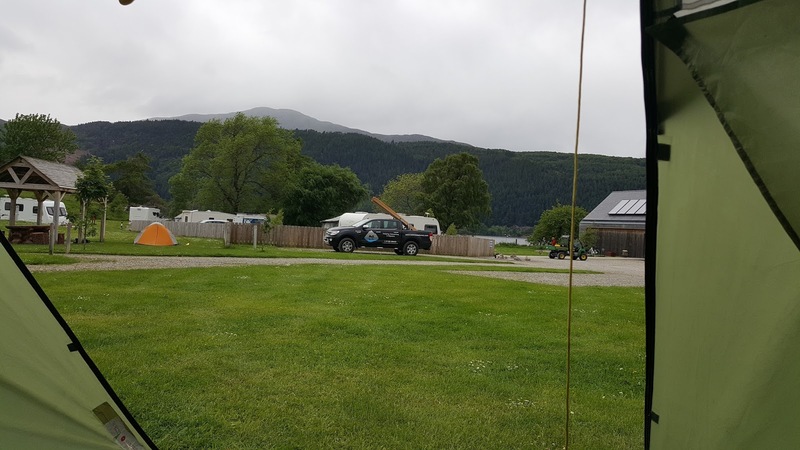 The car did not seem to suffer any damage and the next day a visit to Urquhart bay was made in an attempt to investigate the picture taken by Hayley Johnston back in May. Having walked from the cemetery at Drumnadrochit, through Urquhart Woods to the bay, it was not difficult to find the location and size up the situation which I shall speak on later. On the way back to the car, there is the Drumnadrochit Cemetery. I have visited most of these sites around Loch Ness in my almost morbid curiosity to locate the graves of well known people in the Loch Ness Monster saga. 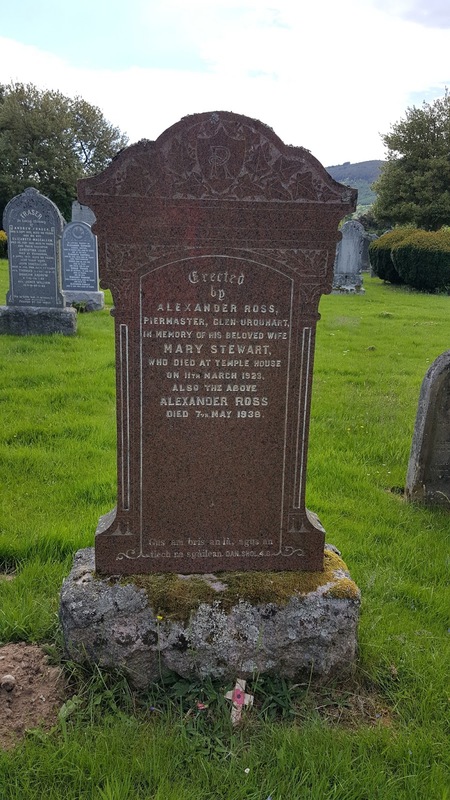 I was not to be disappointed as I came across the grave of Alex Ross, piermaster at Temple Pier, Urquhart bay in the 1930s. 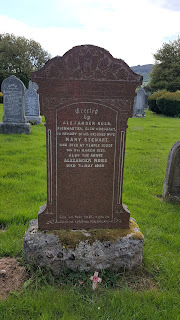 Now a name on a grave may not necessarily be the person one has on their mind, but here the headstone identifies him as the Piermaster of Glen Urquhart. Alex Ross was one of that exclusive band who claimed to have seen the Loch Ness Monster on more than a dozen occasions. You can read more about him in Nicholas Witchell's "The Loch Ness Story". According to the gravestone, he died in 1936. Below is a photograph of him on the left taken in October 1934. Unlike the other high count witnesses such as Alex Campbell and Winifred Cary, we don't know much at all about Alex's sightings and probably never will, apart from one sighting of his which dates back to 1914. How many more lie undiscovered from that time? 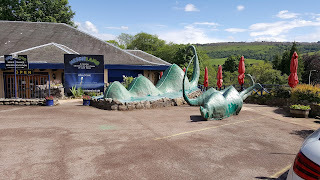 The next day, it was now time to do something I had not done for years - visit what used to be called "The Original Loch Ness Exhibition". I say "used to" because it is now more quaintly called "Nessieland Castle" after a dispute with what used to be called "The Official Loch Ness Exhibition Centre" which is now called "The Loch Ness Centre" after a legal wrangle over who had the naming rights. 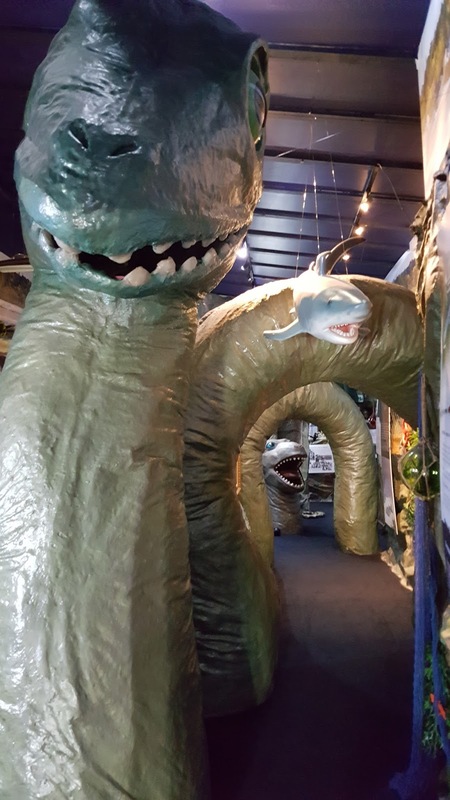 If you hadn't guessed by now, the argument between the owners was not over who got to tell the truth about the Loch Ness Monster, but good old profits and how each others bank accounts were being affected by people going to the other exhibition. The last spat these two had over raking it in was back in 2013 as explained here. 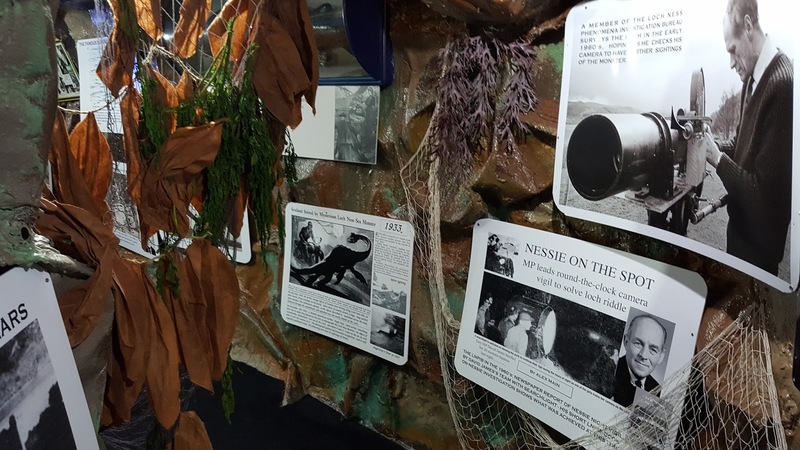 I wrote generally on Nessie exhibitions here. 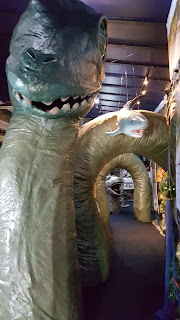 Leaving aside that aspect of the Nessie phenomenon, I arrived at Nessieland to be greeted by three Nessies. Finally, a land sighting of not one but three of the cryptids (below)! Anyway, it was six pounds to get in which seemed cheaper than I recall for the other exhibition. I went in and took some photos which I show below. Now when I last visited the exhibition, it was no more than a couple of sparse corridors with panels of various photographs with explanatory notes. It also gave plenty of space to Frank Searle's photographs despite them being discredited years before. But now there was a more jolly feel to the place as I entered in to be greeted by yet another plastic monster. Having said that, some of the information was of a dubious nature such as the Daniel Parker picture of 2013. How they would handle the discredited George Edwards picture was also of interest since he is listed as a local expert. The picture was displayed with no mention of Steve Feltham's find, but further on in the exhibition, I did find a panel putting forward Steve's fibreglass prop. I suspected that the exhibition has grown in a chronological manner around the corner and it was added in that manner. As I progressed through the exhibition, I could hear the dulcet tones of monster hunter, Gary Campbell in the distance. 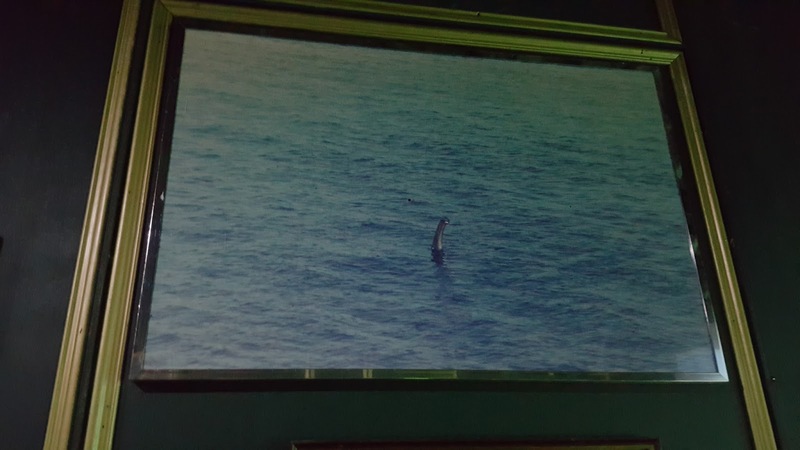 Eventually I arrived at a door leading to a small cinema type room where I took my seat near the Doc Shiels photo to watch a presentation on the Loch Ness Monster narrated by Gary. 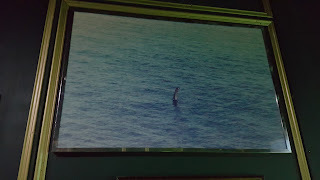 During the presentation, I finally got to see the Bobbie Pollock video (below) which seems to be as elusive as the monster it purports to show. That was good as were the photos taken by Richard White nearly twenty years ago. I must admit I was less impressed by the mention of the "latest research" into quartz deposits, wormholes and Nessies! There was one final surprise I noticed at the end of the tour. 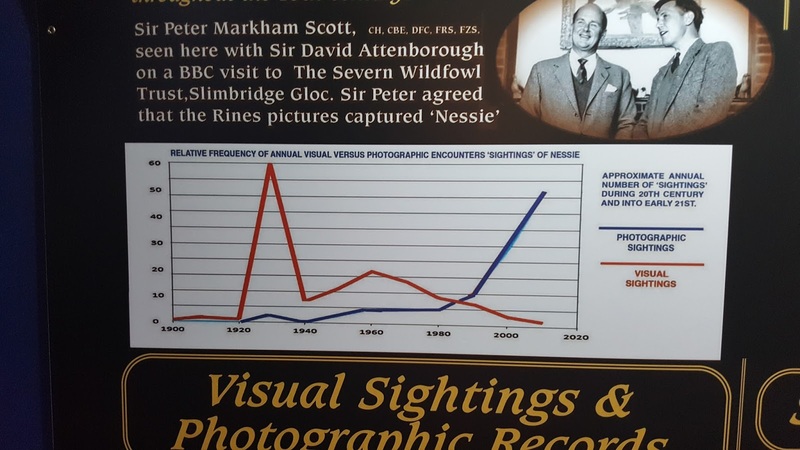 It was a graph showing the number of sightings versus photographic images taken of the creature since the Nessie phenomenon began in 1933. 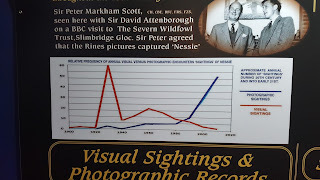 In fact, the graph looked very familiar and then I realised it was a creation of my own which I had made for an article on sightings and mobile phone cameras I wrote in October 2015! I say surprised because I had not given permission to use it. Oh well, only to happy to help Mr. Skinner without any due acknowledgement. But having said that, I think this is a more family oriented exhibition than the one up the road. Any disdain aimed at plastic monsters should be weighed in that respect. I also think they are closer to being even handed in the assessment of evidence. I say that emphasising that neither are 100% even handed. The Loch Ness Centre is too dismissive of alleged evidence for the Loch Ness Monster and Nessieland is too accepting of said evidence. Perhaps that is the best solution, if one were to visit both exhibitions, you get two sides to the argument rather than one and from that the visitor can make their own minds up. After all, this subject is about opinions and not about dogma, despite what you may read from others. I shall be back up at the loch sometime in September.